Wirral has a rich heritage with many historic sites. There are 26 conservation areas in Wirral - including Port Sunlight and Hamilton Square - which are of national importance. The Wirral Conservation Areas and Heritage Trail is a new series of routes that takes in many of the area's historic sites. The trail includes 40 heritage assets and they can be covered on foot, by bike and by car. 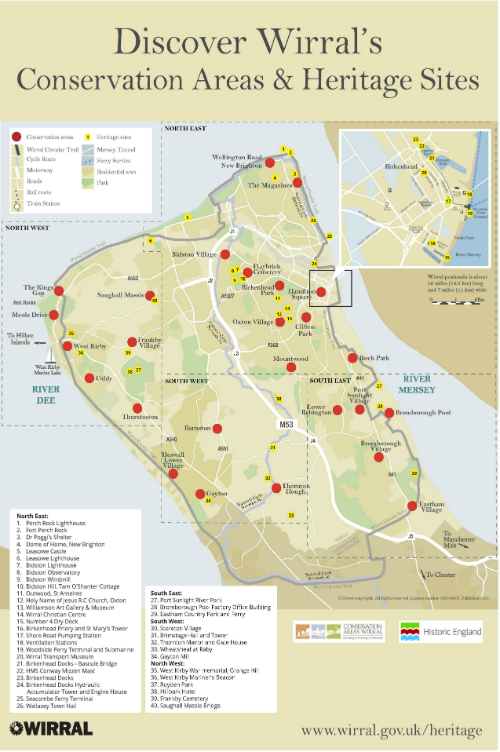 This part of the trail includes Caldy, Frankby, Hoylake, West Kirby, Saughall Massie and Thurstaston. This part of the trail includes Bebington, Bromborough Village, Bromborough Pool, Eastham and Port Sunlight. This part of the trail includes Barnston, Gayton, Lower Heswall and Thornton Hough. The trail has been developed jointly by Wirral Council and Wirral Conservation Areas Forum.